Oh boy, you need this burger in your life. Warm earthy spiced black beans with melty cheese, guacamole and crunchy tortilla chips. I so totally planned this beauty to the minutest detail. Ok. It was 5 p.m. and I arrived at the grocery store without a list or a plan. Its times like this I actually use food products. Shh… Don’t tell anyone. OK, go ahead. Yell it out loud. Just don’t tell Michael Pollan. He’d be so disappointed in me. Well he’d be disappointed in me if he knew who I was. Which he doesn’t. So I’m probably safe. Sometimes food products are yummy and mainly healthy. I just wish I could eat this burger all over again. Why are there only three meals in a day? If you have time, feel free to make your own black bean burgers and guacamole. Or, you can spend 10 minutes prepping dinner and relax for the rest of the night with a good book like I did. 1. Turn the grill to medium high. Brush burgers with oil and sprinkle with garlic and onion powder. 2, Grill burgers for 4 minutes. Flip and grill for 2 more minutes. Top with cheese and cook until cheese is melted. 3. Meanwhile, brush buns with a little butter. Place on the grill for about 1 minute until toasted. 4. Place bottom bun on a plate. 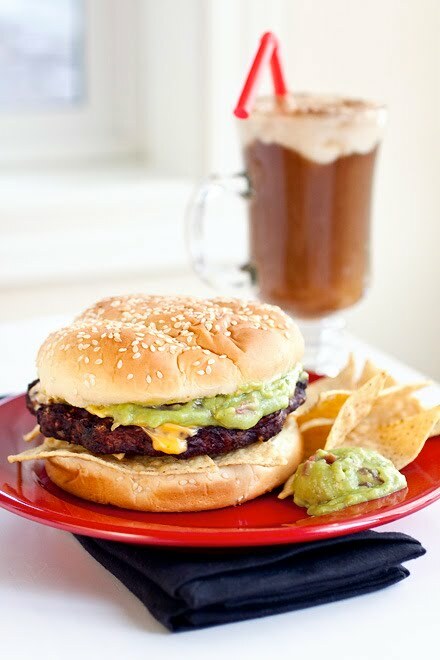 Top with several tortilla chips, then a burger and slather with guacamole. Top with bun and serve. I DO need this burger in my life. And it's going to be! Thanks! Count me in! Only problem is I've never seen those burgers before, but I'll keep my eye open for them!! So delicious, I adore black bean burgers and these look just so tasty! So yummy! I want this burger in my life RIGHT NOW. I saw "The Cooking Photographer" on another blog and got over here lickety-split. I need all the help I can get in the photography department and could even use a nudge or two in the cooking area as well. Like McArthur, I shall return. I actually made black bean burgers ONCE, but I like this 10 minute version:) It looks so delicious slathered in guacamole! And they were actually good even though store bought, that is awesome. Will have to have a better look. Haha I ate these a lot in college and would still eat them today when I'm in a rut or just don't feel like it/have the time to cook. Plus you dressed it up all purty like! This looks amazing! Love these burgers...the guac really spoke to me when I spotted this on foodgawker....YUM! That looks delicious! I am a vegetarian and I'm so excited over this recipe! Woohoo! Thos are one of my favorites, love their black bean burgers and I have tried them all. Laura, these black bean burgers look absolutely delicious! I would have never known there wasn't an ounce of meat in them... they're mouthwatering! I love bean burgers. I like to make a large batch of them and freeze them. I pop them out of the freezer and directly onto the frying pan. Dinner in not time. Haha I didn't even realize this was a veggie burger on Flickr. Love it even MORE now. Especially with that fantastic grilled guac =D.